The Cleveland Movie Blog: Go Home Alone, with the Cleveland Orchestra, on December 18 at 7:30 p.m.
Go Home Alone, with the Cleveland Orchestra, on December 18 at 7:30 p.m.
Now that LeBron James has gone, the only thing significant about Cleveland, we can all agree, is the Cleveland Orchestra. This world-class symphonic ensemble was formed in the early 1970s by Michael Stanley and has become internationally renown for renditions of such historic compositions as Beethoven's Ninth Symphony, Mozart's "Requiem," the tone-poem "Finlandia" by Sibelius, and the TV theme music for Ghoulardi. The long career of the Cleveland Orchestra has not been without controversy. Violent fans of the Cleveland Orchestra - informally known as Juggaloes - rampaged and destroyed the Cleveland Health Museum and the Cleveland Institute of Art. When Cleveland classical-music radio station WCLV-FM held a "nickel beer night" at the old Municipal Stadium, with the Orchestra dynamiting a stack of disco LPs, the fans, mingling with rioting brass and the woodwind sections, damaged the lakefront facility so badly that it had to be completely rebuilt as Browns Stadium. Cleveland sports teams were sentenced to lose in perpetuity as punishment. Okay, much of the preceding paragraph contains inaccurate statements about the Cleveland Orchestra. I've had a bad week, I'm not well paid, and research takes time. So I just made a series of educated guesses. Fortunately I have a flier with this following information, so it is true, or at least not my fault if I get something wrong. On Wednesday, Dec. 18 at 7:30 p.m., the Cleveland Orchestra performs a live accompaniment of the John Williams score to the Christmas classic HOME ALONE. The complete film will be projected simultaneously at Severance Hall in University Circle. This is actually the first of three such orchestra/movie multimedia "Night at the Movies," with CASABLANCA and PSYCHO to follow in the first quarter of 2014. I would suggest the Orchestra play along with some fine silent-era feature, of which there are hundreds. But nobody in University Circle ever asks my advice. So the seasonal treat is HOME ALONE, whose 1990 screen debut shot it to ranking of top-grossing comedy of all time. That was sure one way to spoil child superstar Macaulay Culkin's slim-to-none chances of ever leading a normal life - though compared to what we've seen of former Disney child starlets laterly, Mac's been looking pretty normal (Hilary Duff actually seems to be a nice young mother now, or did they just substitute the troubled real one for a female robot, developed from Hall of Presidents technology?). But I digress; the Chris Columbus-directed monster hit should be remembered as a holiday movie with all the trimmings. 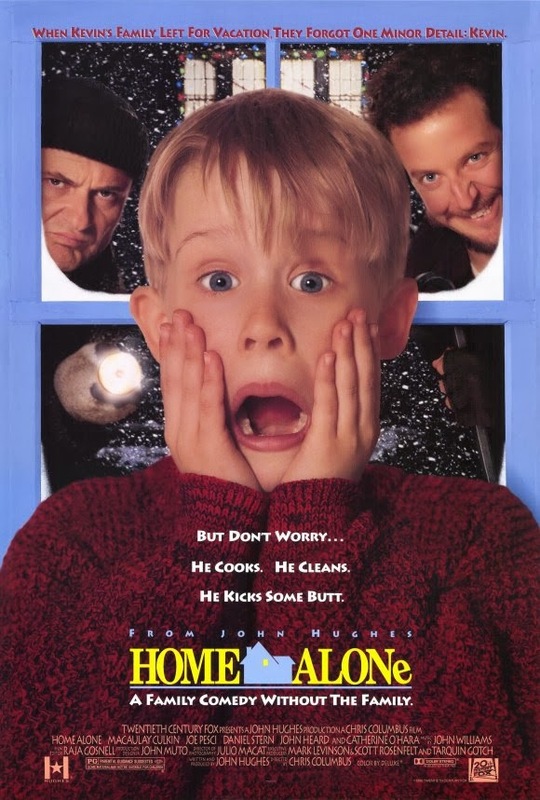 Remember, it's a Christmas trip the McCallister family of Chicago take when they accidentally abandon eight-year-old Kevin to fend for himself against a bumbling couple of burglars laying siege to their mcmansion. HOME ALONE is still an enjoyable and surprisingly heartfelt pic, probably because nobody realized at the time that they were creating a smash of monstrous proportions. In fact, former National Lampoon contributor John Hughes, the scriptwriter here, often bragged he could toss off an entire feature scenarioin one mere weekend, and some of them looked like it; almost immediately he semi-recycled the basic plot for a 1991 teen comedy, CAREER OPPORTUNITIES. Anybody remember that one? Blockbuster this movie was indeed; so much so that, so rumor had, media mogul Rupert Murdoch, badly overextended in his publishing acquisitions, had to wait for weekend ticket receipts from HOME ALONE to be tallied by 20th-Century Fox before his empire could start cutting paychecks for employees. In a hallmark of a good family film, not all critics were charmed by HOME ALONE at the time; a lot of them were already backlashing against John Hughes for writing lots of mediocre youth dramedies (such as the aforementioned CAREER OPPORTUNITIES). But if you really want to appreciate how fun the first HOME ALONE is, just check out its heavy-handed, carbon-copy sequel HOME ALONE 2: LOST IN NEW YORK, or any of the sequels after that. And the film singlehandedly triggered a flood of kiddie comedies in the early- to mid-1909s, as every studio (right down to Roger Corman's direct-to-video unit) sought to chase its success. The only one to really win out on the deal was me; as a low-priority film critic to most of my publishers, I usually got assigned to review them, and that paid for my rent and ramen noodles. I doubt the Cleveland Orchestra will be serenading along to all that cinematic slop. But I've been wrong before. For tickets to this screening/concert of HOME ALONE, call 216-231-1111 or go online to www.clevelandorchestra.com; they're offering discount ticket rates for all three features in the "Night at the Movies" series.